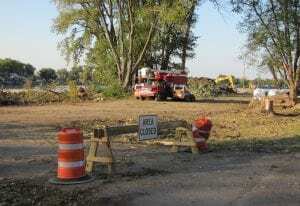 During my 60 years of growing up at Buckeye Lake, I have discovered that we often don’t care or pay attention to what’s happening in other neighborhoods if we aren’t personally affected. We now know that ODNR’s actions have affected us all. 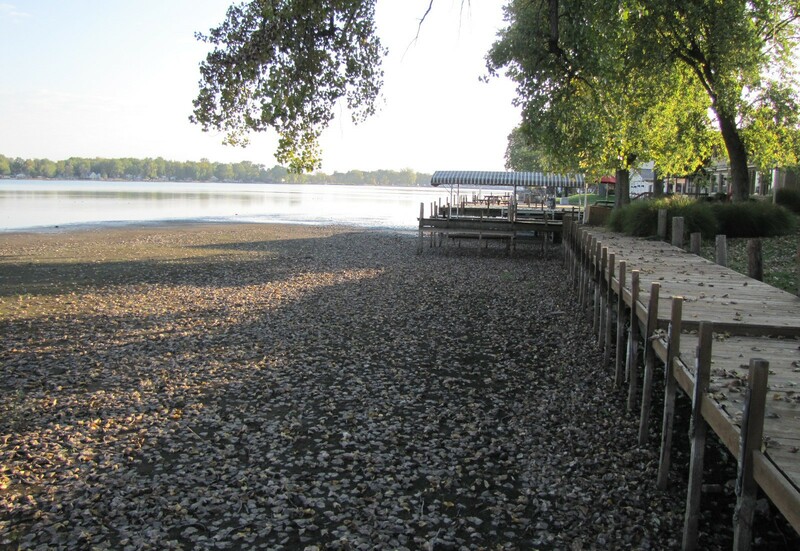 We’ve lost the first of a number of lake recreational seasons, our property values are plummeting and our local businesses are struggling to survive. We’ve been hit – without warning – by an ODNR hurricane. There has been no transparency, in spite of ODNR’s promises. As much as I would like to blame ODNR, they couldn’t have pulled this off without Governor Kasich’s full support and encouragement. Many of you have probably heard of the “mushroom treatment.” Keep them in the dark and fed them ****! That’s how we have been treated. What’s up with all the secrecy and overboard security? Why do we have to read critical information about our docks in a newspaper before we get our letters? Why did they lie about OSHA requiring a six-foot high chain-link fence along the dam? Why do they need a 30-foot minimum wide stability berm and what will it be used for once construction is finished. There are some things we know that might answer some of the unknowns. The new dam must meet dam safety standards which includes being able to handle a Probable Maximum Flood (PMF). So far we’ve heard nothing about how the new dam will handle PMF. Dr. Paul Rizzo’s evaluation this spring for our lake community, recommended lowering the height of the Seller’s Point Spillway by 18 inches this year. That would have improved the ability to handle a PMF even though he recommended increasing the water level by two feet to maintain a recreation season. ODNR’s design for the Seller’s Point Spillway was flawed from the beginning. The spillway discharged much more lake water, but ODNR’s design didn’t include a place for it to go. Instead the South Fork backed up and flooded residents along Ohio 360 and in Buckeye Lake Village. 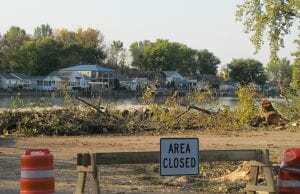 The same thing happened to some downstream property owners at Grand Lake St. Marys. ODNR lost a suit there for damages and has been held in contempt of court for moving so slowly to compensate those property owners. We know very little about the new design. But thanks to Dr. Rizzo, we know what could be done for far less money and time. His design would add about four feet to the existing embankment including two sets of sheet pilings with a concrete barrier between them. PMF would be addressed by increasing spillway capacity which might include a new spillway, and possibly increasing the height of the new dam. The real good news is this work can done from barges which means we could have a recreation season while it is being constructed. It could also be done in about a year and at about half of the current estimated cost. It’s anybody’s guess about what ODNR ultimately intends to do with the 30+ feet berm they are adding to the embankment. We have heard a lot from Kasich and others about how Buckeye Lake will become the “gem of Ohio.” What does that mean? It is something like the Licking County Planning Commission’s Land Use Plan that suddenly appeared in June? Do we really want to attract hundreds of thousands of more tourists here? There’s a reason I’m asking more questions than providing answers. We’ve been given the “mushroom treatment” for more than a year. ODNR even had the nerve to select the residents that are supposed to represent us on the new advisory council. That council isn’t even meeting with ODNR, but with their contractors. ODNR really doesn’t care what we think. The plain fact is we know precious little about the $100-150 million that ODNR plans to spend to replace the Buckeye Lake dam. Simple questions like what kind of docks will be allowed have gone unanswered for months. Why is that? We’re at a very critical point. ODNR has worked hard to pit dam residents against everyone else. Hopefully waterfront residents aren’t so naïve that they think whatever ODNR does to the embankment residents won’t affect them. Please don’t forget that embankment residents have been taking care of ODNR’s property for years. Has anyone ever seen ODNR mowing the dam? But now we are the bad guys. ODNR has taken TOTAL control of this lake will very little input from residents. Work will be starting in a couple of months. We all have a choice to make. Do we stand silently and watch ODNR turn Buckeye Lake into whatever they want? It will be too late to protest when we finally see what they have planned. What can we do? I was considering taking legal action to stop their illegal acts, but I didn’t want to tear apart my beloved Buckeye Lake community. Right now, ODNR seems to be doing that quite well. The first step is education. Residents have to know there is a better dam plan by a nationally recognized dam authority. ODNR hired Rizzo and Associates in 1997 and they completed the most detailed analysis of the dam to date. His plan can be done in about a year and for about half of ODNR’s current estimate. 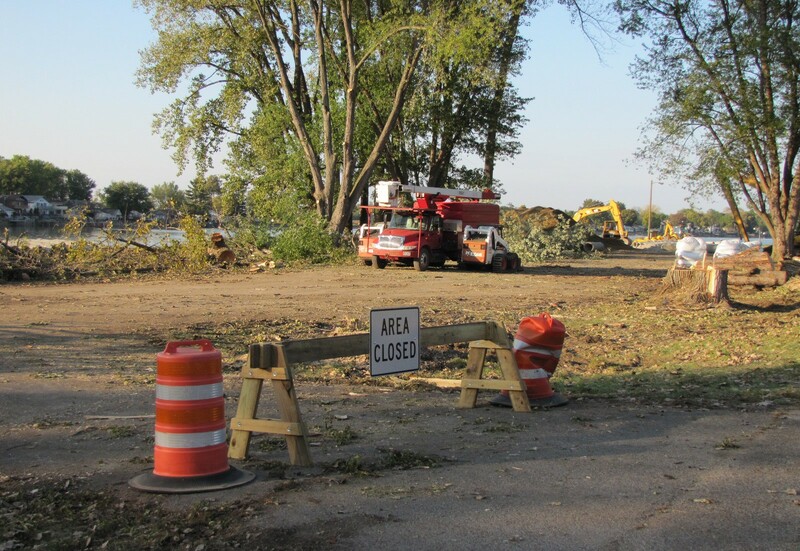 Everybody wins: Taxpayers across Ohio save $50-75 million on the replacement project; Buckeye Lake has a recreation season next year; property values recover; and our businesses can begin their recovery. I’m hearing that people want to help in this battle. Please make me believe that. I know that many of you don’t like confrontation. But we are going to get run over by the Kasich/ODNR machine if we don’t get organized. Your investment here is at stake…protect it! I’m only a person with passion for this lake, not a leader. We have been sold out and worn down this summer. Here’s what’s been done to us so far. With no warning, we lost the entire recreation season this year. Many of you have boats trapped in docks/lifts. You can’t even take your boat to another lake or get it out to sell. Property values are way down. Long-time businesses are hanging on by a thread. We have a few weeks to try to change course. A great first step would be a REAL community meeting. We’re trying to set up something for the week of Oct. 19 in Millersport. Let’s write some letters to our local newspapers to let ODNR know we haven’t given up. You can “like” this effort at A Better Dam Plan on Facebook. We can start raising money collectively to protect the lake and our property. Remember, it’s now or never!